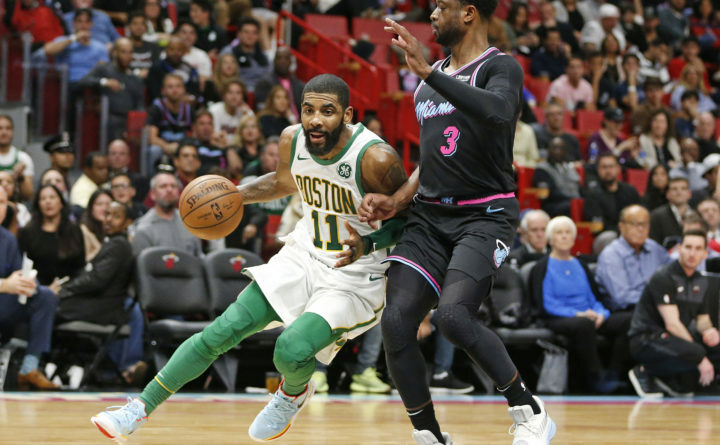 Boston Celtics guard Kyrie Irving (11) drives to the basket against Miami Heat guard Dwyane Wade (3) during the second half of an NBA basketball game, Thursday, Jan. 10, 2019, in Miami. Dwyane Wade knew the Boston Celtics would make a run. Kyrie Irving led all scorers with 22 on 10-for-19 shooting for the Celtics, who scored a season-high 135 points one night earlier in a win over Indiana — but were held under 100 for only the fourth time all season, the first since Nov. 17. Marcus Smart scored 18, and Jayson Tatum and Marcus Morris each had 17 for the Celtics. Miami outscored Boston 17-4 in the final 3:07 of the first half and took a 61-43 lead into the break — the largest halftime edge for the Heat since November. And an 11-3 run to start the third pushed the lead out to 72-46, which would seem to indicate that Miami was in complete control. Celtics: Boston trailed for 4:04 in its last four games, combined. It trailed for 4:14 in the first quarter alone Thursday. … Boston has now lost three straight to Miami, the first time that’s happened since 2012. Heat: It was Miami’s 400th consecutive home sellout. … Winslow wore “RIP Sammy Farkas” on his sneakers, a tribute to a Miami Beach teen who died in a fall earlier this week. … Jones made a 40-footer to end the first half, and had a 60-footer to end the third quarter hit the rim and bounce off. … James Johnson got rave reviews from teammates for dunking on Irving in the opening minutes. “Definitely nice,” Tyler Johnson said. Boston and Miami didn’t play each other in 2018 — the last meeting between the clubs, before Thursday, came on Dec. 20, 2017. The Celtics played every other NBA team at least once in 2018; the Heat played every team besides Boston and Golden State, who they last faced on Dec. 3, 2017 and won’t see for the first time this year until Feb. 10 in Oakland. The game’s first free throw came more than 17 minutes after tip-off, when Winslow got to the line for Miami. Boston didn’t take a free throw until 10:31 remained in the third quarter. Celtics: Visit Orlando on Saturday. Boston is 7-2 in its last nine games against Orlando. Heat: Host Memphis on Saturday. It’ll be the 41st game — the midpoint — of Miami’s season.